Easter is a celebration of spring, light and new life. 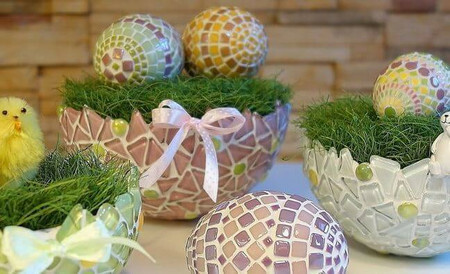 Make Easter decorations with unique mosaic technique, such as animal figures, easter eggs and bowls that last years. Cover the half plastic ball with soft-glass mosaics and mini glass gems and grout it. Finally plant the grass and place mosaic eggs on the grass. We have a wide selection of different sizes of styrofoam eggs, which are easy to cover with different glass mosaics. These easter eggs are made of micro mosaics, millefioris, different ottoman glass mosaics and different 10 mm glass mosaics.